The aim of this book is to demonstrate that becoming a successful do-it-yourself (DIY) investor is within the reach of almost every person in society. Saving or investing in the stock markets is for everyone – from parents with the children’s allowance, to someone who has a lump sum to invest, to the person who has just started working but can save even €100 a month, to someone who is free to manage their own pension. Building an asset base from which you can earn income gives you choices later in life. The aim is that, when you close this book, you should be able to implement an easy-to-follow approach to investing in the stock markets, whilst minimising risk. No matter what level of experience you are starting from, this book is aimed at assisting you to obtain the returns on offer from the markets over time. Arming yourself with a proper strategy or plan, which dictates what you buy and when you sell, is the key to stock market investing, and developing one is a good deal easier than you may think. That plan might be simply to invest across the different asset classes where there appears to be clear value on offer; to concentrate on high yielding funds listed on stock markets as a method of generating income, while controlling risk; or to master some successful approach to stock selection. 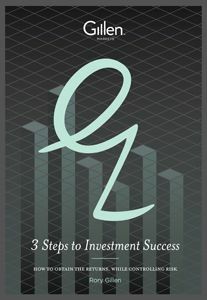 3 STEPS TO INVESTMENT SUCCESS offers an easy-to-follow mechanical approach to selecting a diversified portfolio of stocks from the UK FTSE 100 Index, an index that represents the 100 largest companies listed on the London Stock Exchange by market capitalisation. You will learn also how to invest in the stock market indirectly through listed funds, such as exchange-traded funds and investment companies, which offer instant diversification, allowing you to more easily control risk. And 3 STEPS TO INVESTMENT SUCCESS includes a short story, A Villa in the Sun by Virginia Gilbert, a BAFTA-nominated, award-winning writer and director, to drive home the often real consequences of speculating in markets rather than investing. Rory Gillen attempts to demystify the process of investing in this easy-to-read guide that will appeal to novice investors or those unsure of what to do with spare cash. He emphasises the value of regular saving, noting the power of compound interest. If you can save a portion of your earnings each month, over time, you will build an asset for yourself with no debt attached. If you can generate a return of 8 per cent a year, that will turn a €250 monthly investment programme into €46,936 after 10 years, while after 20 years you will have €148, 269. Getting that level of return is the challenge and Gillen provides advice on the type of investments that can generate this. He recommends adopting a tried and tested approach to investing that has at its core an emphasis on value, as he argues that it is value on offer in the asset you buy that largely determines the subsequent returns over the medium to long term. Don’t let volatility interrupt your plan and realise that you have natural advantages over the institutional (professional) investor and that success accrues to the well-prepared investor but rarely to the speculator who wants only quick results. Becoming a successful do-it-yourselfer (DIY) investor is within reach of almost every person in society, argues Chartered Accountant, Rory Gillen, FCA, in this practical and readable guide that explains an easy-to-follow approach to investing in the stock markets aimed at delivering results over time while minimising risk. 3 Steps to Investment Success includes a short story, “A Villa in the Sun”, by Virginia Gilbert, a BAFTA-nominated award-winning writer and director, to drive home the often real consequences of speculating in markets rather than investing.